I've written an article for TechTarget.com about using the Mystery Mail Merge. The one that used to be in 1.x, and now...well, it's in there, but how the heck do you get to it? I cover that, and how basically it's just a dandy middle-of-the-road choice between rolling your own, and using the powerful but complex Mail Merge Wizard (they're two different things). I've written an article for TechTarget.com about using the reporting tool in the new Base Module in OpenOffice.org. 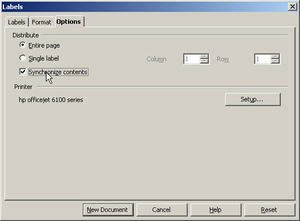 It's about how to create a new report using the report wizard, using the prefab templates, etc. I've grown disenchanted with this tool. I recommend using this approach instead. I've written an article for TechTarget.com about using the new mail merge wizard in OpenOffice.org 2.0. It's an extremely powerful tool; there's a fair amount of work to get it set up but then you've got a lot of very useful features. When I worked at Sun, there were a few things people always asked, that were hard to figure out. How in the world do you open a perfectly good .txt or .csv file (comma-separated values) in a spreadsheet? Basically, you've got data in rows and columns, but separated by tabs or commas rather than columns in a spreadsheet, and you want it in a spreadsheet. 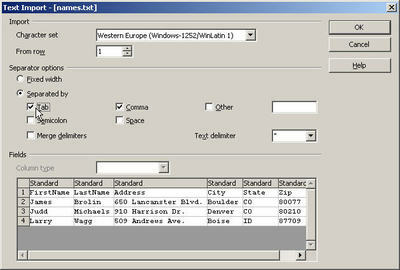 Comma-delimted files are a common way to get data out of a spreadsheet or database and into another. 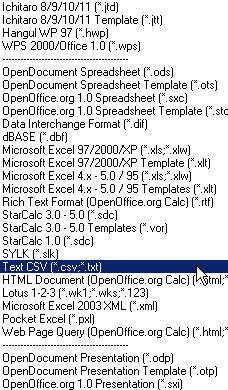 The trouble is, in OpenOffice.org, if you just choose File > Open, the .txt or .csv file opens in Writer. Not what you want. Here's how to open it in a Calc spreadsheet. 1. 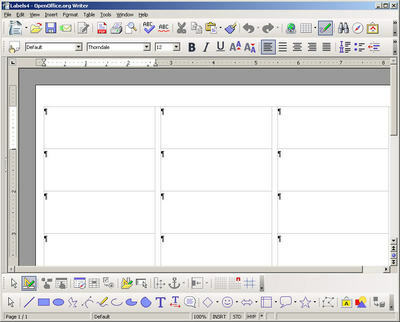 Start OpenOffice.org. You can be in Writer, Draw, Calc—it doesn't matter. 3. 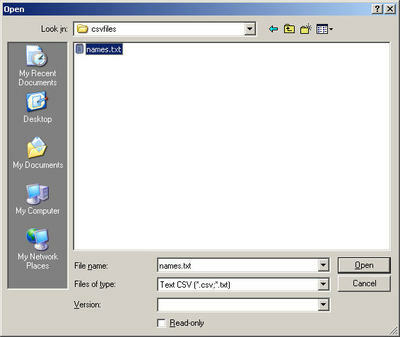 In the File Type list, select Text CSV. It's about a third of the way down the list of types, or you can click in the file type list and press T four times. 4. The window should now look like this, so just click Open. 6. Also in the same window, if you have date-format data or other formats you want to specify, you can do that column by column. 7. When you're done, just click OK. You'll see the data in a spreadsheet. 8. You'll want to save it as a spreadsheet at some point. 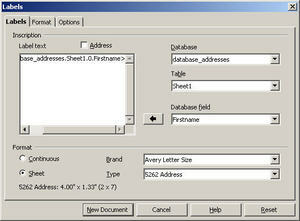 Choose File > Save As and select the standard OpenSpreadsheet .ods format. 1. Let's say it's the other way around—you've got a spreadsheet and you want it to be in a nice neutral .txt or .csv file. Be sure the file is open. 2. 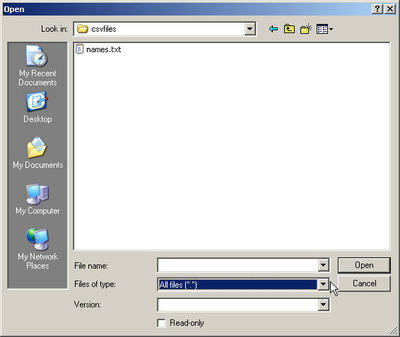 Choose File > Save As and select the same Text CSV format in the file format list. This time you can click T just once. 4. You'll probably see this message. Click Yes. 5. 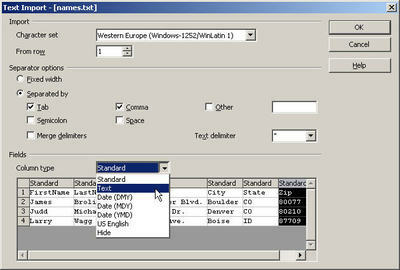 In the next window, specify the type of character you want to separate columns, commas or tabs or another character. 6. Click OK; you're done. This post is similar to the big post here on how to do version 1.1 labels, etc. It works pretty much the same way. However, this is a nice little standalone HTML post on how to do labels in 2.0 so you might prefer this. First, create a database. You can do this by choosing File > New > Database. I've written an article on how to do this if you just want to connect to a spreadsheet, text file, or address book as your data source. I recommend spreadsheets. Once you've got the database set up in OpenOffice.org, you're ready to go. 3. 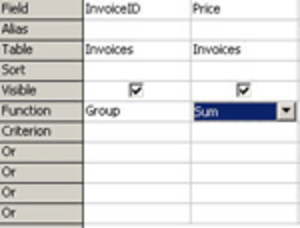 Select a table, Sheet1 if you're working with a spreadsheet, from the Table list. 5. Click the arrow next to it to insert it in the text field. Type a space after the field and you can add the next field, such as LastName. 7. 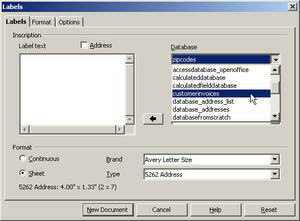 In the Brand dropdown list, select Avery Letter Size. 8. In the Type dropdown list, scroll through the billions of labels. Select the type of label you're using, 8160 Inkjet Address. The label type is on the label sheet or box of labels. 9. Click the Options tab. 10. Select the Synchronize Contents option. 14. Click the New Document button at the bottom of the window. The labels will appear. If you need to make changes, like adding spaces, rearranging fields, or changing formatting, do so in the upper left label, then click Synchronize to apply those changes to all labels. A message will ask if you want to print a form letter. Click Yes. 15. If you want to print labels for only certain records, you can select them in the scrolling list of records. Select one, press Ctrl, select the next, and so on. Or you can select a range of records like 1-20. 16. If you want to just print all the labels, choose All. 17. When you're ready, just click OK. If you have any problems printing, check your printer setup using your operating system setup tools. Note: Feel free to use the formatting features. Make the text an interesting font, or make it the size you need. You can also right-click on the border of the upper right label, choose Frame, go to the Border tab, and give it a background color. This is an article on creating an OpenOffice.org datasource that''s actually just a spreadsheet, text file, or address book. 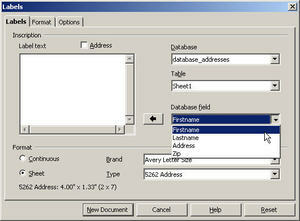 See also the articles on forms in the new OpenOffice.org 2.0 database tool: part 1 and part 2. The article is long and detailed. Here's the key point. You need to get to know your printer and let it know to expect envelope shapes, not letter or A4 shapes. You also need to fiddle around for a while and figure out where--left, right, perpendicular, parallel--in the tray your printer expects envelopes. Buy a box of cheap envelopes and expect to waste a few while you experiment. 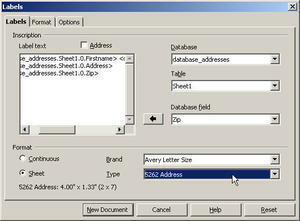 You can also choose Insert > Envelope, and use the three-tabbed window that appears. The next time you want envelopes, just use that same document you already created, and change the addresses. 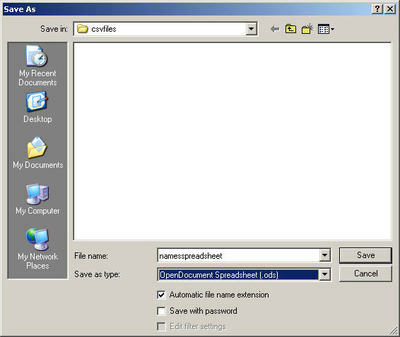 Either save the document in myimportantdocuments\envelopes, or if you're a template kind of person, make it a template. Note: You can get label templates from several online resources including the WorldLabel templates here. OpenOffice.org 2.0 is out, but I wanted to make sure that everyone out there in OpenOffice.org 1.x land knows how to do mail merges. Everyone isn't going to be converting to OpenOffice.org 2.0 the day it comes out, so I hope this information will be useful for quite a few people for a while. Mail merges are things like sending a holiday newsletter to everyone in your address book, with the same content but addressed to Dear Bob, Dear Mary, and so on. Mail merges also apply to envelopes and labels, since you might also want to print one envelope with the address for Bob on Main Street, Mary on Elm, and so on. The procedure for doing mail merges isn't hard...it's just not obvious. 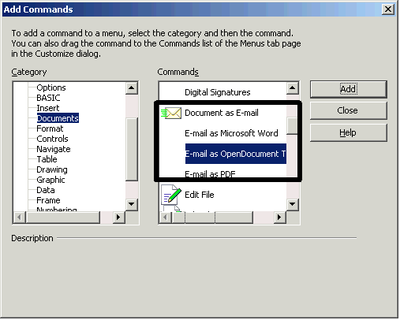 I'm posting the mail merge procedures from my GetOpenOffice.org Comprehensive Writer workbook, as well as the lab files that you need to do the exercises. Enjoy! It's easy when you know how.